Both the governor and the WFP went into the weekend needing something from the other. The governor walked away with what he wanted. The party got an IOU. Has New York state’s Working Families Party come up with the formula for forcing centrist Democrats to the left and delivering bread-and-butter progressive policy? That was the hope on Saturday night outside Albany, where the party gathered to make its endorsements for state races later this year. Faced with losing the ballot line to a challenger who tapped into resentment over his estate tax cuts, charter-school championing and failure to deliver campaign finance reform, Governor Andrew Cuomo won the party’s designation only after promising to fight for Democratic control of the state Senate and deliver a progressive policy wish list. Progressives in the Empire State are getting used to hearing that their moves serve as a model for the broader movement. That was the take on Bill de Blasio’s mayoral victory last fall, and it’s how Cuomo’s backers cast the endorsement vote this weekend. “The eyes of the country are on you,” said Attorney General Eric Schneiderman to the party faithful in the ballroom of the Desmond Hotel. Schneiderman and de Blasio put their solid progressive credentials to work for Cuomo in pushing Working Families state committee members to back the governor and not Zephyr Teachout, the academic and activist who had emerged as a progressive alternative. The sales pitch worked: Cuomo won a solid (if not commanding) 59 percent of the vote to Teachout’s 41 percent. But the endorsement vote and the deal that secured it don’t represent success. The real test of the WFP approach—honed since its founding in 1998 and facilitated by hard work in hundreds of contests for local and state office—will be whether Cuomo delivers, which won’t really be clear until his second term is under way. What exactly is the Working Families Party all about? This is the question many New York progressives have asked themselves as they stepped into the voting booth in election after election over the past sixteen years to see the party’s name, usually on Row D.
The WFP is not a third party in the traditional sense. It was formed in the late 1990s out of the ashes of the short-lived New Party to take advantage of a quirk in New York state’s election laws that, virtually alone among the states, permits “fusion voting,” in which a party can cross-endorse members of another party. The tactic—also used by the state’s Conservative and Independence parties—has deep roots in progressive politics. In the 1930s, socialist trade unionists formed the American Labor Party here basically to give people on the far left a way to support FDR and the New Deal without pulling the Democratic lever. Born in the era of Clinton’s centrism, the WFP offered something similar: a way for progressives, frustrated with the party’s direction, to support Democrats against the GOP, while sending a signal to Dems that their power depended on votes from a mobilized left wing. In 2010—the previous statewide election year—the WFP had 42,000 members in New York State but its ballot line generated 155,000 votes for Cuomo. The Democrats claimed 5.8 million members and generated 2.6 million votes in the governor’s race while the Republicans, who boasted a 2.9 million-person enrollment, managed to collect 1.3 million for their disastrous nominee, Carl Paladino. In other words, while the two major parties drew about half as many votes as they have registrants, the WFP pulled three times its enrollment in votes . The WFP’s power is rooted in careful calculations about how to sustain and expand that influence. It has rarely backed quixotic challengers, even those running against lackluster Democratic incumbents. Often, the party throws its support behind establishment Democrats who are likely winners—sometimes to the disappointment of insurgent primary candidates—because doing so permitted the party to maintain its juice. Back an inspiring loser and you get to sit in the wilderness and reflect on your ideological purity; back a ho-hum winner, and you at least get to stay in the game. That’s the logic. So while the party has rolled the dice at times—like backing Letitia James in her 2003 race for City Council—it has played it very, very safe at others. Despite deep misgivings on the left about Hilary Clinton’s support for the Iraq war in 2006, the WFP backed Clinton against a left-wing challenger. In 2005, when Freddy Ferrer mounted a long-shot challenge against billionaire Mayor Michael Bloomberg, the WFP dithered so long on whether to support Ferrer that when it finally did, it was too late to actually get him onto the ballot. It’s all been about the long game: aligning with marginally acceptable candidates who’d deliver at least modest policy gains, and using those victories to build the institutional power that would permit the WFP to someday push for more—and, logic suggests, turn push into shove. Once a party reaches a certain strength, it’s as fearsome an enemy as it is an attractive partner. It has the capacity not just to reward loyal politicians for fulfilling their promises, but also to punish people who defy them. The WFP reached a milestone in that evolution this weekend. Two things were clear from the moment one walked into the courtyard of the Desmond. One was that Cuomo really, really wanted the party’s backing. The other was that many, many WFP rank-and-file desperately wanted to tell the governor to go to hell. On the other side were labor unions—long the backbone of the party’s financing—and grassroots organizing groups who wanted to take the deal Cuomo was offering, which represented major concessions by the governor. While Cuomo has hewed to progressive principles on social policy by backing gay marriage and gun control, he hasn’t on some other issues. In this year’s budget he pushed for estate tax cuts and tax breaks for banks. He used de Blasio as a foil during a dust-up over charter schools earlier this year that resulted in extraordinary giveaways to charters in the state budget. He also resisted de Blasio on full funding to universal pre-K and on a push for local control of the minimum wage. Cuomo has failed to deliver on women’s equality and campaign-finance reform, often blaming the inaction on a state Senate controlled by breakaway Democrats and Republicans—an arrangement Cuomo has until now done nothing to challenge. In his message to the WFP convention—delivered via pre-taped video and a brief phone call—Cuomo embraced the cause of a Democratic senate, signed on to increasing the minimum wage and giving cities a say in setting it and vowed to pursue campaign-finance reform, the DREAM Act, marijuana decriminalization and other goals. This was, Cuomo’s backers told the WFP state committee, everything the party had fought for since 1998: a commitment by a governor almost certain to win re-election to deliver dozens of policies with real impact. “We’re not talking the old same-old, same-old—incrementally raising the minimum wage,” said New York Communities for Change’s Jonathan Westin. Teachout’s supporters didn’t dispute that Cuomo had shifted considerably. Their argument was that he couldn’t be trusted to deliver. After all, Cuomo won the WFP’s support in 2010 and then turned his back on many progressive goals. What would be different this time? Hadn’t the party grown big enough to stop having to hold its nose in the voting booth? Indeed, the party’s decision was just about the deal. Had they said no to Cuomo, the WFP would have created a powerful enemy in the governor’s mansion and probably seen much union support for the party vanish. Less than twenty-four hours after the vote, there were still signs of misgivings. Not surprisingly, Teachout articulated some of them. But WFP leaders themselves displayed concerns, too. In a statement praising the deal, WFP Co-Chairwoman Karen Scharff said, “We do, however, believe the Governor fell short in his commitments to education funding in this state. To actually meet the needs of New York’s children, the Governor will need to fully fund schools at the Campaign for Fiscal Equity levels, and we will press him to do so.” The CFE was a legal settlement that committed the state to rectifying decades of unequal school funding with new spending; that money has never fully materialized. Some Teachout supporters believe that, having sided with the governor, the party will now lose some grassroots support to the Green Party and its candidate, Howie Hawkins. The numbers are unlikely to threaten the governor’s re-election but will eat away at the size of his margin of victory. Cuomo is widely believed to want to post a record landslide in November, both for bragging rights and to serve as the prelude to a potential run for national office. Cuomo’s need to run up the vote total created a unique set of circumstances for the WFP. He didn’t need them to win, but he needed them to win big. There aren’t many elections where a small party is really important to a candidate who’s almost certain to prevail. And progressives in others states should also note that the WFP already occupies an unusual position because New York is one of the very few states that permits fusion voting. Together, these complicate the question of whether the WFP approach creates a roadmap for frustrated progressives elsewhere. 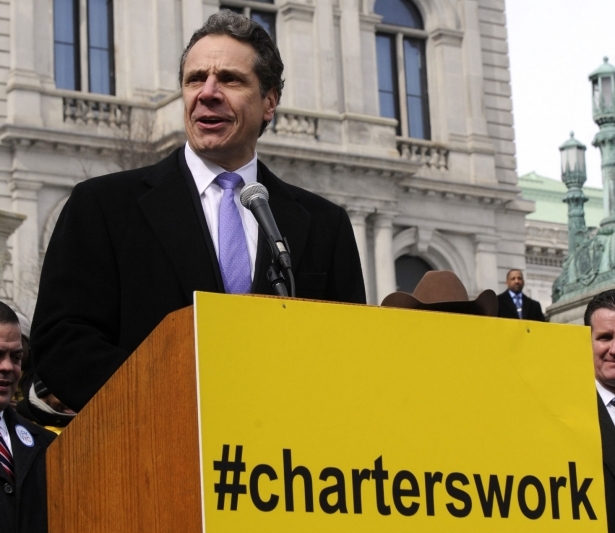 The larger uncertainty about the WFP’s model is around the Cuomo deal itself. If Cuomo delivers on his IOU, life will improve for low-wage workers, immigrants, women, grassroots political candidates and others. If he doesn’t, the 2014 convention could go down as a miscalculation. Some WFP members are already looking ahead: One delegate on Saturday night tried to nominate Teachout for the governor’s race… in 2018.